"John Major is a man of mystery -- except to readers of this, the world famous biography that reveals the man and his psychology." 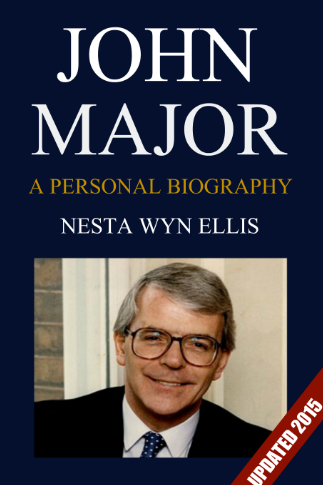 Nesta Wyn Ellis's world famous biography of John Major, Prime Minister of the United Kingdom for 6½ years from 28 November 1990 to 2 May 1997. Nesta has lived in the UK, US, Kenya and France and is a former Parliamentary candidate for both Westminster and European Parliaments. Major agreed to co-operate with her biography of the Prime Minister, which was first published in 1991 (John Major - Macdonald; hardback 1991; paperback 1992; Japanese translation 1993) has since been fully updated in 2015. Major first became Prime Minister when he succeeded Margaret Thatcher as leader of the Conservative Party. He then led the Conservatives to victory in the April 1992 general election. In the 1997 general election the Conservatives suffered their worst result of the 20th century and their place in government was taken by Labour, led by Tony Blair. "Nesta Wyn Ellis has a genius for reconstructing family atmosphere, in John Major's youthful home and in his home today. Read her at the bus stop and you will miss your bus, engrossed in her psychological bull's eyes." "Nearly - but not quite - an accidental masterpiece."